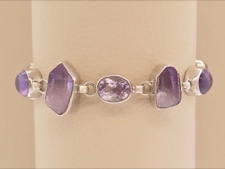 What a unique mix of amethyst cabochons, faceted ovals and crystals. The natural crystal points are a variety of amethyst known as Vera Cruz and were mined from Los Vigas Mine in Veracruz, Mexico. These laser wand crystals have fine clarity and luster and the soft lavendar color they are known for. Note: These crystals are now quite rare, as the mine was closed several years ago. 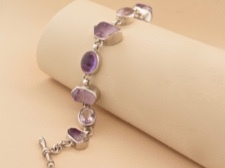 These amethyst are set in sterling silver and connected by sterling links. The sterling toggle can close at 6.5, 7, and 7.5 inches. A lovely, regal collection of natural stones.